Former Morecambe striker Padraig Amond has signed for National League side Grimsby. 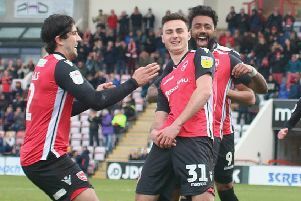 The popular Irishman was let go by Jim Bentley in the summer after two years with The Shrimps and has now signed a one-year deal with the Mariners. Amond will join Marcus Marshall, also released by Morecambe this summer, at Grimsby after the winger signed for Paul Hurst’s side earlier in the week.